In our 890GX review I looked into integrated graphics performance of the entire Clarkdale lineup vs. AMD's chipset offerings. You can get a look at the full set of data here, but I'll also provide a quick summary here. 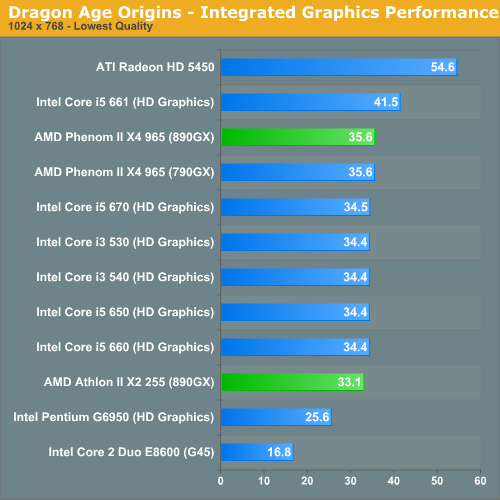 Thanks to its 900MHz GPU clock the Core i5 661 does much better than AMD's integrated graphics. The rest of the Clarkdale lineup is basically on par, and the Pentium G6950 is a bit slower. 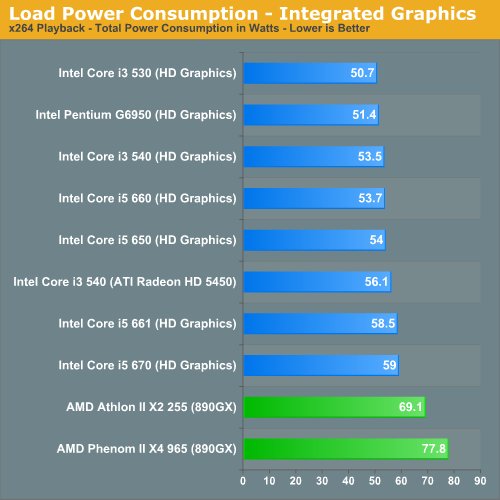 Note that the G6950 is still over 50% faster than G45. That was just a terrible graphics core. Here even the Core i5 661 can't best AMD's 890GX. Intel's integrated graphics performance can range from much slower to competitive if not faster than AMD's depending on the game. Unfortunately in a couple of key titles Intel is much slower. Using GPU clock speed as a means to differentiate CPUs isn't a wise move if you're trying to build up your reputation for not having terrible graphics. If you're not going to do any gaming and you're using the integrated graphics for Blu-ray playback, it's a much better story for Intel. Under load the entire Clarkdale line is very conservative with power consumption. 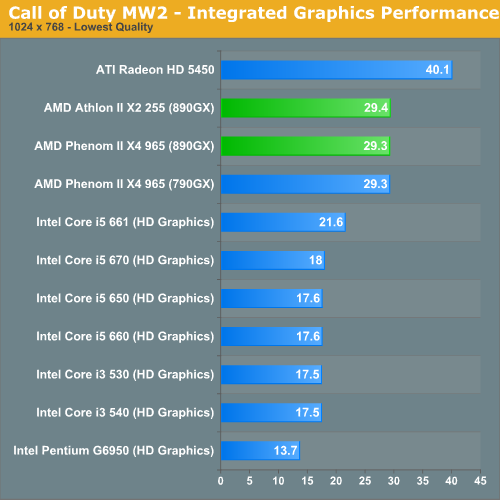 We're presenting an abridged set of benchmarks here in the review to avoid this turning into too much of a graph-fest. If you want to see data that you don't see here check out all of these CPUs and more than 100 others in Bench. Unlike to the apologists above, it should be obvious to most readers that testing power consumption with discrete graphics further dilutes results, especially regarding power savings. Which one is used for O'Clocking? I don't think anyone is going to buy this chip at their local computer shop. Even for a cheap HTPC you'd be much better off to get a full clarkdale for the hyperthreading and turbo mode. Good job, Anand, as usual. I don't keep up on the hardware front as much as I used to, and having just built a new i5-750 system I was concerned for a moment as I hadn't heard about these new chips before doing my build. I want SandyBridge, i dont know why i never liked this generation architecture. I still have the perception ( no matter how much benchmark i read ) that it simple doesn't offer any performance improvement over C2D or those previous cheap Core2 Quad. As a C2D owner I also don't see much reason to upgrade to an i3. but if I needed more performance, the i5/i7 would be worthwhile. and many people might upgrade from something older than C2D. If I started a PC from scratch, the i3 for $ 120 is really really good compared to everything else in that price range if one considers power consumption and overclocking. Obviously, someone who buys an i3/i5/i7 today won't see much reason to upgrade to Sandy Bridge either. But starting from an older platform (even C2Q), Sandy Bridge will be worthwhile. I almost think, unless you are power user, one always is best off skipping every other CPU generation. You could buy an C2D for common installed base (with similar mainboards as other PCs you have installed). Or you might buy one for the perfect last-generation board you buy for a new computer.